Brown Recluse Spider, common name for a small brownish spider found mainly in the central and southern United States. Also known as the violin spider, it is characterized by a distinct violin-shaped patch on its cephalothorax (head and midregion). 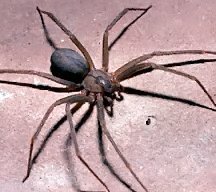 Except for the black widow spider and certain related species, the brown recluse spider is the only United States spider whose bite can be dangerous to humans. The brown recluse spider is about 1 cm (about 0.4 in) long and has six eyes. It spins a sheet web that may be found in secluded areas among rocks or in houses. The bite causes a long-lasting sore that involves tissue death, and severe reactions to it may become life-threatening. The spider may live more than ten years. Other species related to the brown recluse spider occur in the Mediterranean area, in Africa, and in most countries of the Americas. Scientific classification: The brown recluse spider belongs to the family Loxocelidae of the order Araneae. It is classified as Loxosceles reclusa. Support our project, so we could place more interesting information here! Click here for details. http://encarta.msn.com © 1997-2009 Microsoft Corporation. All Rights Reserved.